Is Turkey Bacon Better for Your Health Than Regular Bacon? For many people, the smell of bacon frying in a pan is pure heaven. Bacon is eaten with breakfast meals and as an ingredient in salads, but there is concern that its high fat and sodium content is not healthy. Many companies have gotten the word, and now offer turkey bacon, a lower sodium, lower fat alternative to pork bacon. Several companies now sell turkey bacon. While turkey bacon is not considered an overall healthy food, it stacks up a bit better in the numbers game compared to pork bacon. While turkey bacon definitely contains less fat and sodium than regular pork bacon, this does not mean it is a healthy food. It is a bit healthier, but both types of bacon are processed meats that are cured with sodium nitrate. A study performed by the American Institute for Cancer Research clearly showed that regularly eating processed meats containing sodium nitrates, including turkey bacon and regular bacon, increases the risk of developing certain cancers. Turkey bacon and regular bacon are best enjoyed occasionally, and should not be part of your everyday diet. The serving size listed for turkey bacon and regular bacon is one piece, but this is a bit deceiving. When cooked, an ounce of turkey bacon is still an ounce, but regular bacon loses about half its weight during cooking. One slice of cooked pork bacon, weighing 8 g, contains 42 calories, while one slice of turkey bacon, at 14 g, contains 25 calories. Most people have more than one slice of bacon at a time. 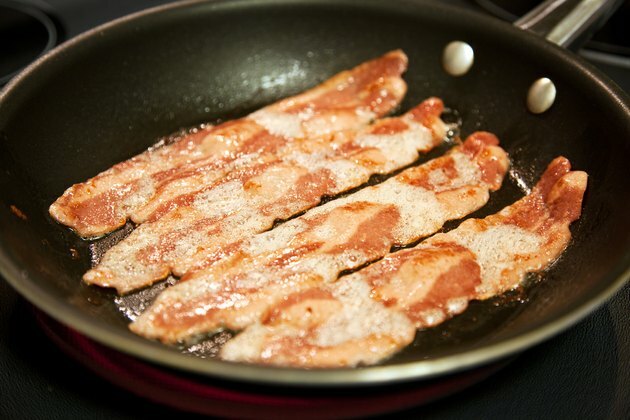 This means a typical side of three pieces of pork bacon has 126 calories and turkey bacon has 75 calories. Turkey bacon and regular bacon both contain protein. There are 2 g of protein per slice in turkey bacon, and 3 g per slice in regular bacon. A slice of turkey bacon has 1.5 g total fat, of which 0.5 g is saturated fat. This means three pieces have 4.5 g total fat and 1.5 g saturated fat. One piece or regular bacon has 3 g total fat, with 1 g saturated fat, meaning three pieces contain 9 g total fat with 3 g saturated fat. The American Heart Association recommends limiting your daily intake of fats to 25 to 35 percent of total calories, and saturated fats to less than 7 percent. Ingesting a lot of saturated fat increases the risk of developing heart attack and stroke. Regular bacon has 192 mg of sodium per slice; three slices contain 576 mg sodium. Turkey bacon has a bit less sodium, with 135 mg per slice, which adds up to 405 mg sodium for three pieces. Sodium is an essential nutrient that must be obtained through the diet, as it is not manufactured by the body. A healthy adult should eat no more than 2,300 mg of sodium a day. If you have heart disease, you should limit your sodium intake to less than 1,500 mg a day.